Ali Cavit Çelebioğlu, the founder of the Çelebi Group, was born in Balıkesir's Gönen county in 1926. After completing primary and middle school, he enrolled in the non-commissioned officers academy, where he first became acquainted with the profession to which he would dedicate the rest of his life: aviation. In 1945 he graduated as a master pilot and was assigned to the Air Force. 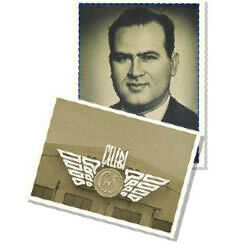 During his career in the Air Force, Çelebioğlu became aware that ground handling services were as important to aviation as flight itself, an idea that was reinforced by his training in Germany and in the United States. After leaving the Air Force, Ali Cavit Çelebioğlu enrolled in the law faculty of Ankara University while also working in the private sector. While employed by Pan American Airways, the idea of starting up his own company and striking out on his own started to grow in his mind. The one thing that he was certain of was that it would have to do with aviation. On 1 February 1958, Çelebi Hava Servisi was founded in Ankara. With one boarding ramp and just five employees, he succeeded at what in those days was thought to be impossible. By doing so, he laid the foundations of the Çelebi Group, which deploys some of the most advanced technology available and employs thousands of the best-trained people in Turkey today. Decisiveness, diligence, courage, and unbounded vision were Ali Cavit Çelebioğlu's most important qualities. Ali Cavit Çelebioğlu was a man who recognized the importance of ground handling services in aviation long before anyone else in our country and who single-handedly spearheaded the way for the birth and growth of its civil aviation industry. Ali Cavit Çelebioğlu's life and career were cut short by his untimely death in 1982. His spirit and vision however live on.